After eight work parties along Thornton Creek, Shoreline volunteers have removed vast amounts of weeds from a large area and replaced them with native shrubs and trees. 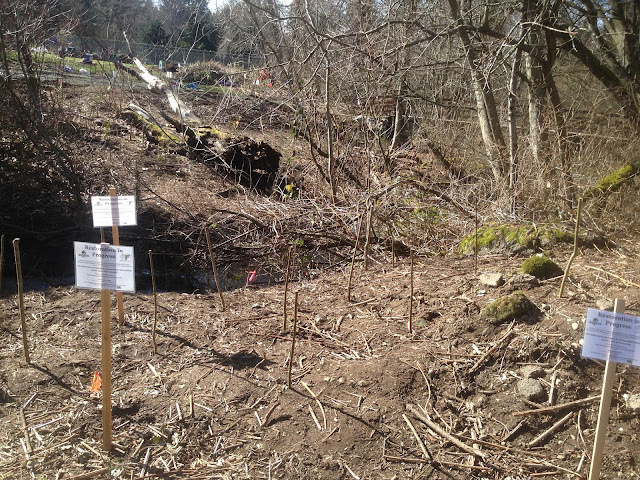 With our warmer weather, the new plantings should spring to life and attract new wildlife along the creek. With plans to restore habitat in a wider area, the Restoration Stewards sponsored by the Washington Native Plant Society continue to need new volunteers. You may join us this Saturday at the work site adjacent to the parking lot in the southern end of the park located along First Ave one block north of 149th St. Avoid the lot at 155th St. The lot could be full so 149th St and vicinity is an alternative place to park. We will supply tools, gloves, water and light snacks or bring your own. We work in any weather so dress for rain or cold and wear boots as well as sunscreen and hat if needed. Please email to let us know you are coming or for questions.